Greenhouse gas emissions from food production may threaten the UN climate target of limiting global warming to 2 degrees Celsius, according to a paper from Chalmers University of Technology, Sweden. What is the data? No data needed. Tomorrow, the Intergovernmental Panel on Climate Change (IPCC) is releasing another report on the impacts of climate change and while it isn't as aggressive in its claims as previous reports, there is still cause for concern. Western nations like the United States have dramatically reduced greenhouse gas emissions from sectors like energy and those are far and away the biggest contributors to CO2 - but the new paper claims even eliminating those emissions would not guarantee staying below the UN goal - and they blame agriculture. Emissions from agriculture, they say, threaten to keep increasing if there is more meat and dairy consumption. 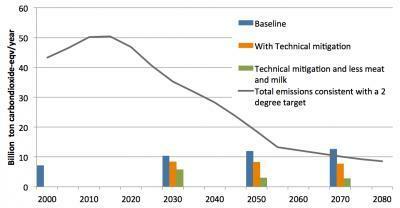 If agricultural emissions are not addressed, nitrous oxide from fields and methane from livestock may double by 2070. This alone would make meeting the climate target essentially impossible. "We have shown that reducing meat and dairy consumption is key to bringing agricultural climate pollution down to safe levels," says co-author Fredrik Hedenus. "Broad dietary change can take a long time. We should already be thinking about how we can make our food more climate friendly." By 2070, there will be more of us on this planet and they associated human diets with high emissions. Though agriculture has dematerialized in the last 30 years to an extend that farmers produce more food with fewer emissions on less land than at any time in human history, they believe agricultural science will come to a halt today - but they put everything else on an upward curve. "These emissions can be reduced with efficiency gains in meat and dairy production, as well as with the aid of new technology," says co-author Stefan Wirsenius. "But the potential reductions from these measures are fairly limited and will probably not suffice to keep us within the climate limit, if meat and dairy consumption continue to grow." Beef and lamb account for the largest agricultural emissions, relative to the energy they provide, they claim, at least using the 'it takes a gallon of gas to make a pound of beef' claim that has been repeatedly debunked. Using the flawed metric, they claims that by 2050 beef and lamb will account for half of all agricultural greenhouse gas emissions, while only contributing 3 percent of human calorie intake. Cheese and other dairy products will account for about one quarter of total agricultural climate pollution, they say.